In 2018 when most of us will likely have multiple jobs (if not careers) in our lifetime, the need for continued growth and learning, both personally and professionally, is imperative. As someone whose career path has more closely resembled my three-year-old daughter’s drawings (full of loops, swirls and curves) than a straight line, I have personally benefitted tremendously from professional coaching. When you google “executive coaching” or “leadership coaching,” thousands of options pop up. 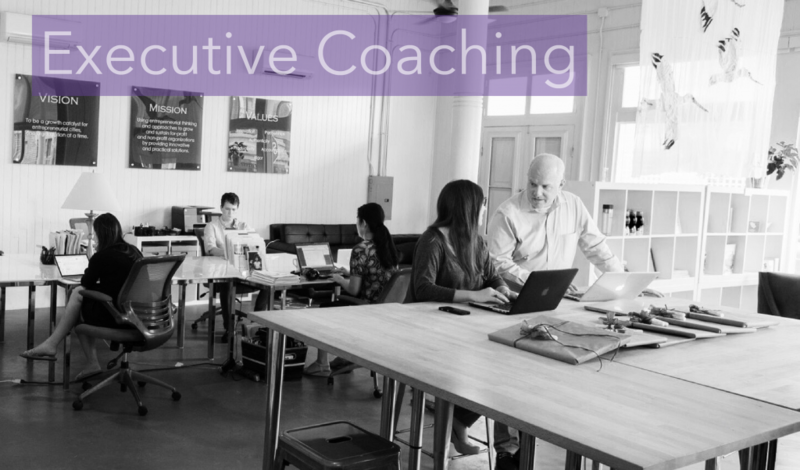 Whether you’re in a stage of career growth / exploration, stepping into a new role at work or seeking to expand your leadership skills, executive coaching can help you set strategies, prioritize actions, and stay accountable to your personal and professional goals. Though it can take effort to discern quality from quantity, the benefits of finding the right coach can be career (and life) changing. So how can you identify a quality coach and what should you expect from your sessions with one? I aim to share my personal experience and insights with you in this post. Selecting a coach is much like dating. You may have in your mind a certain “type” of coach that you’re looking for, but it ultimately comes down to how the coaching relationship makes you feel. Beyond their background, experience and area of expertise, I’ve found that the most effective coaches have deep empathy, yet don’t hesitate to hold me accountable and gently push against my assumptions when needed. You may want to look for a coach who fills in your gaps. For example, if you get overly caught up in the details, you may want to work with someone that has a track record of visionary leadership. Or if you are easily distracted or often veer off topic, a coach who is more methodical about helping you stay focused may be helpful. Lastly, don’t be afraid to ask for references from their current or former clients to get a sense of how the coach has impacted the lives of their client. One thing I’ve found helpful is notes from the coaching session. This is one practice that my boss, Kevin Wilkins, who by several client accounts is a phenomenal coach (shameless plug), introduced me to. He provides notes for his clients following each coaching session to help remind them of what was discussed and any “homework” they may have in between sessions. If your coach does not offer this service, I highly recommend you take it upon yourself to jot down key takeaways from each coaching session. As your sessions progress, it’s often easy to forget the ground you’ve covered with your coach and those nuggets of wisdom that you’ll inevitably get from the right coach. Having a place where you can refer back to what you discussed not only helps you stay grounded week to week on your work at hand, but over time serves to capture the progress and growth you’ve hopefully experienced. Although an executive coach is not a replacement for a mental health professional (and the good ones will be honest with you if they feel that line blurring), I’ve found that the coaching relationships I’ve benefitted most from are those where the coaching is focused on both my professional and personal growth. If the idea of blending the personal into a “leadership” or “executive” coaching relationship raises questions about professionalism for you, I understand. If your company is paying for your leadership coach, I would ask about the coach’s confidentiality policy ahead of starting the relationship. Will everything that you share in your coaching sessions stay between just you and your coach? Or is the coach required to report back to the company on your progress in some manner? If it’s the former, then I encourage you to find a coach who you feel you can connect with not just on an intellectual level, but on an emotional one as well. Beyond their people skills, a quality coach takes time to understand the nuances of your situation, listening actively, and collaborating with you to create a customized plan for your goals. They work with you to help you frame your weaknesses in challenges into opportunities for growth, and they check in with you at every session to see how you are progressing, offering tips and strategies to tackle the real world along the way. Who should partner with a coach? Coaching is truly an investment in yourself, and whether you’re self-funded or sponsored by your workplace, coaching is only effective if you are willing to put in work. Think of coaching as you would any other professional development opportunity: as an investment in yourself, your company, and your career. Coaching is perfect for professionals who are going through a transition. Maybe you’re re-entering the workforce after having a baby, or you’re looking to groom yourself for an executive role in your organization. The greatest – and saddest – myth is that professionals should only turn to coaches when they are in crisis. While executive coaches can provide advice and practical solutions to work through professional challenges, they are equally as effective at helping you avoid a crisis in the first place. Perhaps you’re new to managing others, or you aren’t confident in your financial abilities, or you are a natural introvert who has just entered a relationship building role, a coach can guide you to set the right plan of action to overcome the challenges associated with those situations. A coach is also great for those in top tier leadership. It is comforting to know that as the executive advisor of your organization, you have someone to turn to for help in working through new or uncertain situations. What will you get out of coaching? Great executive coaches want to set you up for sustainable success. They provide opportunities and solutions for self-growth that empower you to stand on your own as a confident leader for the long-term. Coaches can also serve to hold you accountable to your goals and progress by checking in on a regular basis and being a phone call away in a time of seeming crisis. A great coach is on your team. They celebrate your success and help you identify patterns unique to your style that help you achieve more. One of the most valuable lessons coaches bring to the table is an expansion of perspectives and perceptions. They help you cut through your assumptions on the behavior of others, as well as guide you to understanding how others in your organization act or react to certain situations. Working with a coach won’t give you all of the answers, but it will provide you with the confidence and skills you need to understand situations in your daily life so that you are empowered to find the best solutions and make smart decisions in your tenure as a leader at any level of the organization. Learn more about trepwise’s Coaching Platform HERE & apply for a coach HERE.